He’s gone by many names and accomplished many heroic deeds. But now, it’s time for the world’s first super hero to get back in the game! 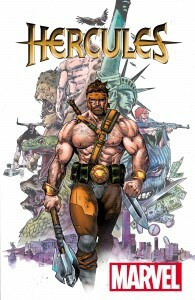 Today, Marvel is pleased to present your first look at HERCULES #1 – the new series from Dan Abnett and Luke Ross! Time to show the world why he set the bar for heroism in the first place. Whether its street crime or cosmic level threats, not labor is too big or small for the greatest son of Olympus. But a new evil has awoken – one that will push the demi-god to the limit and test his mighty resolve. Witness the Marvel Universe through the eyes of one of its most powerful warriors, and the heart of a true champion. A modern world, an age-old hero and non-stop action await you in HERCULES #1 – on-sale this November!